Victims of burglary often speak of the emotional and psychological impact of burglary as well as the financial loss. They often feel unsafe in their homes, bereft at the loss of items of sentimental value and angry that someone felt they could invade their space and take things that don’t belong to them. You can see from this previous post that 60% of burglary victims never feel safe again, 25% feel they have to move home and 20% said they didn’t feel comfortable being in their house on their own. So would it make you feel better to meet the person that burgled you face to face? Would you like to ask them why they did it? Do you want them to know what impact their actions have had on you? For many victims, it can help the healing process to gain more of an insight into the incident and take away some of the mystery, and therefore the fear. The Restorative Justice Council has several case studies on its website relating to burglary victims meeting the person who burgled their home. Viv said “I needed to make him realise what it had been like for us. Restorative justice was the right way for us to help Jack see what he’d done and steer him in a better direction.” For her it was about getting the young man who burgled her home to understand what he’d done and give him a reason to make better choices. 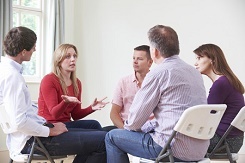 While certainly, a key objective of restorative justice is to help victims deal with what’s happened, the process also aims to help the perpetrator as well. It helps them to see how their crimes have affected people in a very direct way. Feeling genuine remorse can be a very effective deterrent to committing further crime. See all Restorative Justice Council’s case studies here. In the security business we speak to a lot of people who have been victims of break ins (because many don’t take security precautions until something happens) so we understand a little of the impact that it can have. While we would always advocate preventative measures, it’s good to know that there are systems in place to help deal with the emotional aftermath of a burglary. So, would you want to meet the person who burgled your house? Let us know in the comments or on our Facebook page.